Chiun must return to Moo, a civilization 5,000 years old, where the ancient throne is in mortal danger. 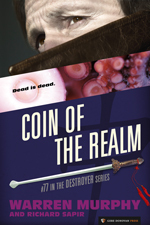 Octopus people are threatening the king, his subjects are in revolt, the treasury is loaded with coins, and the Princess wants Remo for her very own. A New Age imposter, impersonating Roy Orbison, wants the treasure and heads after the CURE duo with a deadly team of mercenaries. Greed may destroy them all.